I suppose it’s been a while since I’ve written about anything I’ve made. For good reason it turns out. In the last few months we bought a new home which led to a lot of work on our old house to turn it into a rental property, as well as the mayhem that is moving. The good news is that I have a lot of projects saved up to tell you about. 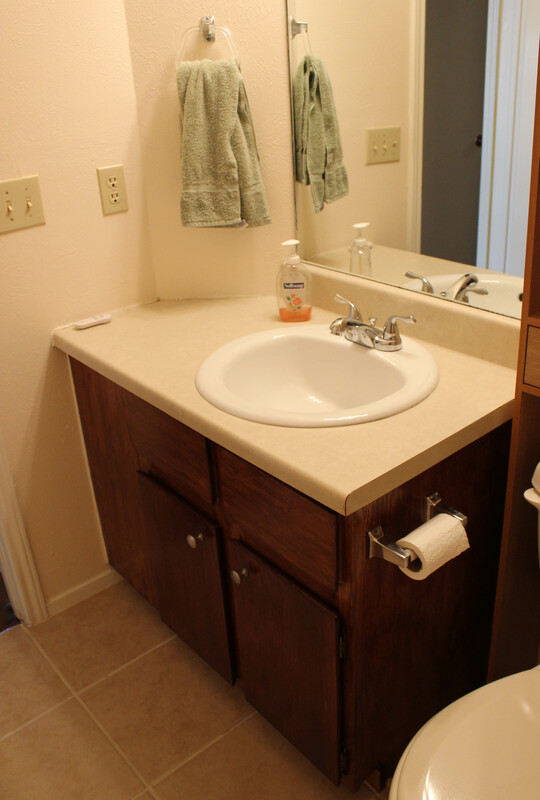 The first project is something I really should have done years ago, which is refinishing the bathroom cabinets. They looked pretty terrible and I was embarrassed to think about showing the house in that condition. A bit of internet research later I decided to use gel stain to refinish the cabinets. The finish on the cabinets was worn through. 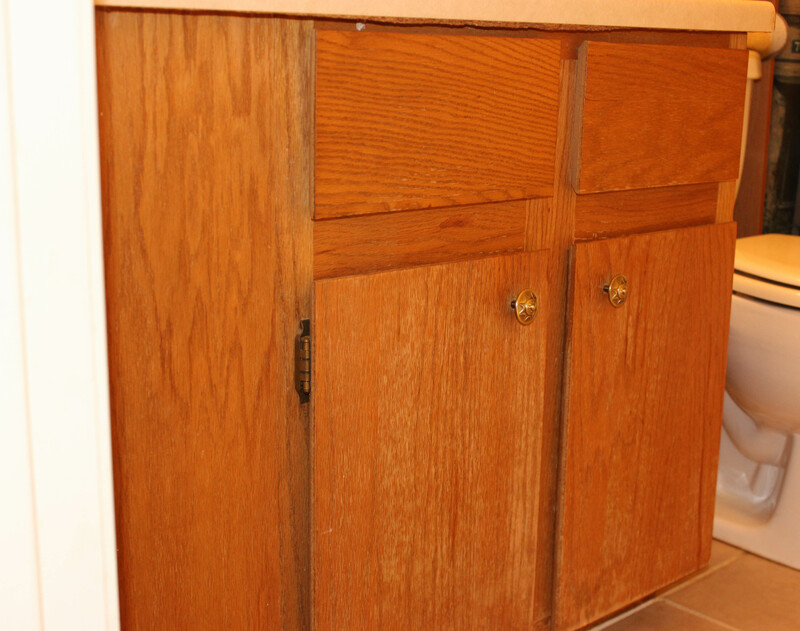 Sand the cabinets with a coarse sand paper followed by a finer paper. I didn’t worry about completely removing the finish that was there, but mainly just to scuff up the surface and remove any left over grime. 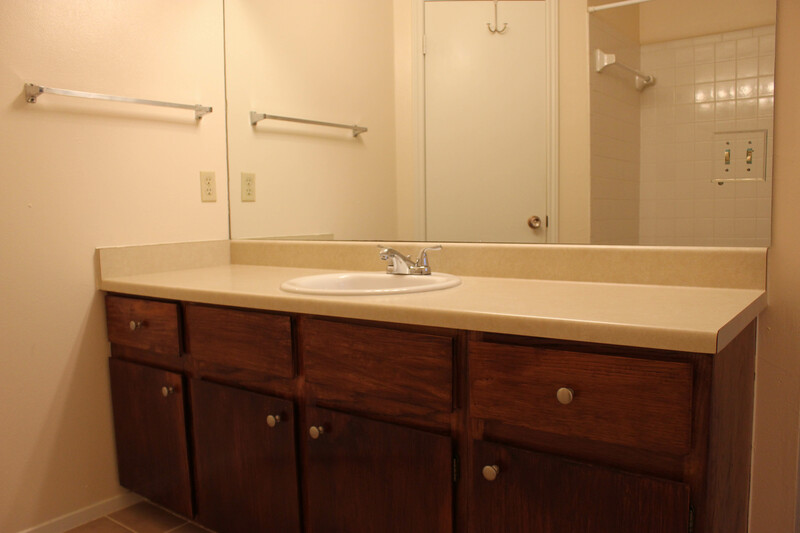 Wipe down cabinets with mineral spirits to remove the dust. Apply the gel stain. The gel stain needs to be stirred pretty thoroughly first. I used a combination of a stain brush and old rags to apply, depending on how much surface area I was covering. I found that it was important to make sure the stain was applied very thin or it might not adhere when the polyurethane was applied. To do this, I used a rag to wipe off the excess stain a few minutes after I had applied the stain. This tended to be more of an issue when using the brush. The gel stain is a bit more work to apply than liquid stain, but it stays where you put it so you don’t have to worry about drips, which is especially helpful when staining the parts of the cabinets fixed to the wall. Let the stain dry. In humid Texas weather, this was much longer than what the directions claimed. To see if it was dry, I touched the stained surface to see if it felt tacky. If it was still tacky, I kept waiting. Once we moved out I moved the cabinet doors into the house so that they could dry in the AC. After dry, it’s time to apply polyurethane. Use a foam brush. It’s pretty easy to apply. The coats should be thin. 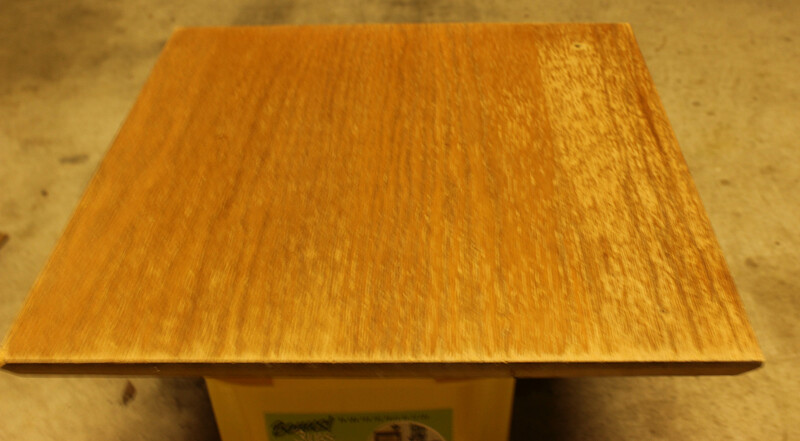 They take 3 – 4 hours to dry before you must sand the finish, clean off the dust, and apply again. At least two coats are necessary. After two coats, reinstall the hinges and knobs. I replaced the old 80s looking knobs with some simple satin nickel knobs. The finished product was a HUGE improvement. After replacing the light fixture, sink, faucet, and refinishing the cabinets we were a bit jealous that someone else got to enjoy our not so hard work. The upgrade was pretty cheap. The stain supplies ran less than $30 for two bathrooms and I had plenty of stain and polyurethane left over, currently being used on another project.